Waverider touches Superman for a second time to see if he might possibly become Monarch. 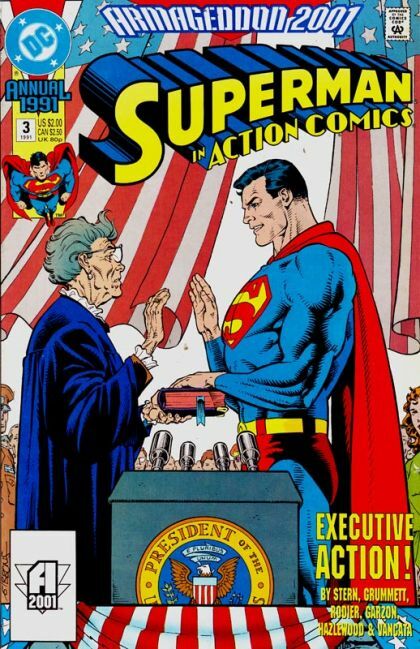 He witnesses a future in which Superman becomes president and begins to bring peace to the world. He even recruits fellow heroes to help in this quest with only Guy Gardner opposing him for not dealing with the enemies of the U.S. in a more aggressive manner. Superman beats Guy, taking his ring in the process and Hal allows him to keep and use it. After Waverider breaks contact, Superman flies off and saves Pa Kent's life from an accident that killed him early on in his possible future.